A few years ago, when my daughter Nina was going off to university in London, I started jotting down our tried and tested family favourite recipes so that she could cook up a little bit of home whenever she wanted to. Six years and many, many recipes later, I have finally published it on amazon Kindle. 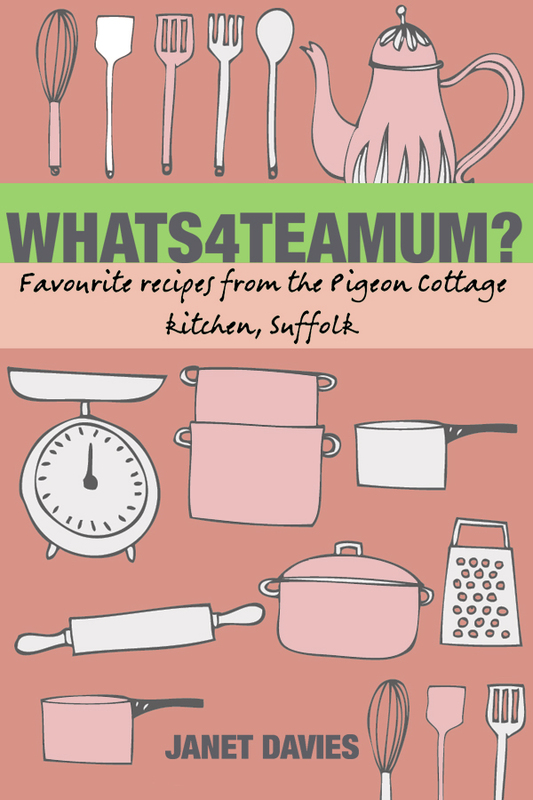 It’s called “Whats4teaMum?” Favourite recipes from the Pigeon Cottage Kitchen – you can download your very own copy for the princely sum of £3.08 in the UK, or $4.58 in the US. If you’re a Brit, you’ll find my versions of classic recipes for dishes that will be very familiar to you, such as how to make a tasty beef stew with dumplings and superlative sausage and mash with onion gravy. However, there are plenty of recipes that may well be new to you including spicy prawns with courgettes and sausage bread and butter pudding. If you’re from anywhere else in the world, you’ll get a fascinating insight into what a modern British family actually eats and how to make these recipes for yourself very easily. You might be surprised by how cosmopolitan our influences are – Indian inspired curries and stir fry dishes from Asia are as commonplace on our weekly family menus as a classic Sunday lunch of roast beef , Yorkshire pudding and all the trimmings. If you do decide to download a copy, I hope you’ll enjoy it and that you’ll let me know how you get on with it. I take my copy with me everywhere so I can easily replicate my favourites away from the Pigeon Cottage Kitchen. I’ve tried to write the recipes in a straightforward and logical manner that will work every time. The ingredients should be widely available and I’ve even thought about how to save on unnecessary washing up as well. Above all, everything is meant to be tasty and a pleasure to eat and share with your friends and families. Enjoy! This entry was posted in Food and drink chatter, Recipes and tagged Amazon Kindle, British food, Cookbook, Cooking, family recipes, home cooking, Janet Davies, Pigeon Cottage Kitchen, recipe book, recipes, whats4teamum, Yorkshire pudding. Bookmark the permalink. Good Luck with your Launch Janet, it’ll soon be time to come over and pick some lovely Blackberries!